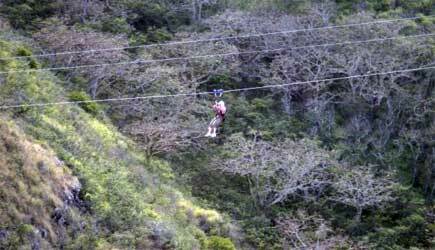 This page presents the most extreme zipline tour on Maui. 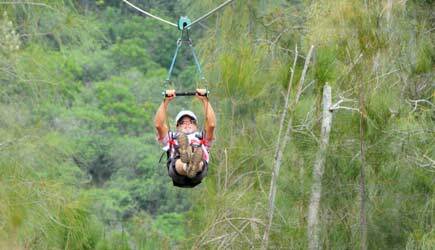 If you are looking for more kid friendly zipline experience that takes children as young as five, be sure to see our Maui Zipline page. 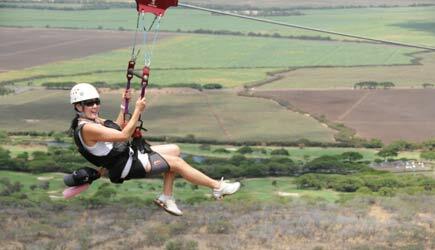 We also offer Kaanapali Zipline and Haleakala Zipline. 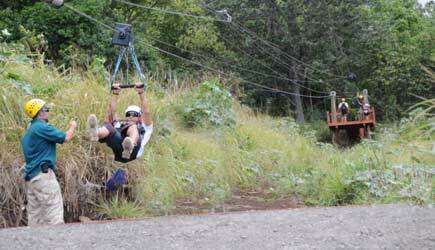 Speed is definitely a factor here at Flyin' Hawaiian Zipline! Line 3 zips you 600 feet above the valley floor! The final line is over two thirds of a mile long! This is Maui's most extreme adventure! Reserve your space NOW to guarantee availability! URGENT!!! This tour often sells out weeks in advance! 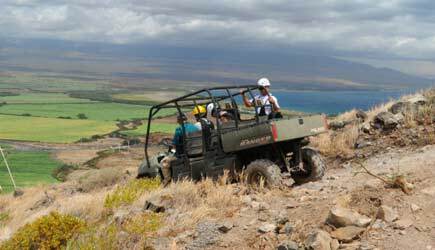 Book this tour well in advance of your arrival on Maui! Private Tours: From May 15th to August 31st private tours are offered at 3:30pm for groups of 4 to 6 people. The private tour rate is $225 per person (plus 4.167% Hawaii sales tax) and a mandatory $125 gratuity for the guide. 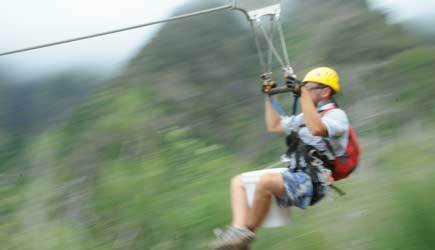 Maui's longest and highest and fastest zipline course, Flyin Hawaiian Zipline has raised the bar to new heights in every imagineable way. 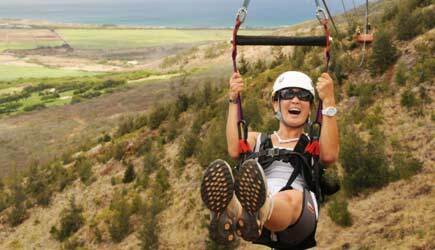 This brand new course offers eight zipline experiences, including the longest and most amazing ride in Hawaii on their grand finale line ... a staggering 3600 feet in length! That's over two-thirds of a mile ride on one single zipline! They have other really long lines too; their 2800 foot line is tied for the second longest line in Hawaii, and there are also lines of 2100 feet and 1900 feet. 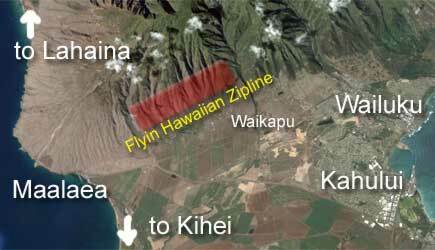 Flyin Hawaiian Zipline is so long that the course actually starts and ends in two different towns! Your tour begins at the Maui Tropical Plantation in the village of Waikapu, and the course ends in Maalaea a little over a mile from the Maui Ocean Center Aquarium and Maalaea Harbor. 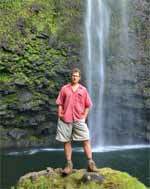 Their location in Central Maui makes it a convenient drive for guests staying in both South Maui and West Maui. Following check-in, you will board a 4 wheel drive van which takes you up a dirt road through old sugar cane fields and inside the picturesque Waikapu Valley. Here you will get set up with your gear and do the first line, which is their "trainer line." This line is 250 feet long and just a few feet off the ground. It is designed to familiarize guests with the equipment and to gain confidence in the zipping system before moving on to the really long, really high lines. Zipping is really quite easy; the guides are responsible for securing you in your harness and attaching your trolley to the line each time you zip. There is very little for you to do but to sit back and enjoy the ride. Following the "trainer line" guests then board a six-seat ATV called a "ranger" which is driven by one of the guides. 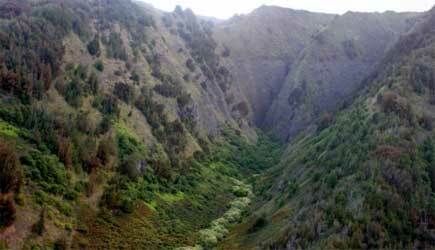 The ranger transports you to the top of the ridge on the south side of Waikapu Valley to the 1500 foot level. A short but moderately strenuous uphill trail leads to an observation deck where you look out and over the valley, and watch in amazement as one of your guides zips across the second line, which is 2800 feet in length, to a landing platform you can barely see on the other side. Before you know it, it's your turn and you are effortlessly flying through the air, soaring past the spires of the majestic West Maui Mountains. Most zipline courses either cross back and forth over a gulch or they start at the top of a mountain and work their way down going back and forth. This course is different. 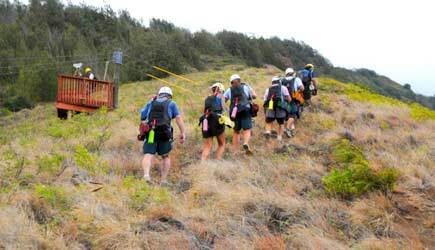 You start at the top of a ridge, and sail across 11 ridges and 9 valleys during the tour working across the slopes of the West Maui Mountains from north to south. This second line crosses a very wide valley and lands on the next ridge. The third line starts on that ridge, and crosses the next valley, landing on the next ridge. The fourth line ... well ... you get the idea. This is not just an adventure ... it almost feels like a means of transportation! The third line is 1900 feet long, and has the greatest vertical elevation drop of any line on the course (about 500 feet). You will attain speeds of up to 55 miles per hour on this line! There is no sensation of free falling though; you will feel a gradual acceleration and then shear speed when you hit the middle of this line. The fourth line is a smooth cruising line that is 2100 feet long. The sixth and seventh lines are 800 feet and 600 feet respectively, and then the final line comes into view. The distance this line covers is hard to believe; the landing platform on the other side of the 3600 feet of line is hard to even spot! This final line crosses close to the tops of three ridges which offers a great perspective on the speed you are traveling. The entire course offers stunning views of the West Maui Mountains, the Central Valley of Maui, Kahului Harbor and Maalaea Bay, and Halaeakala. At the the conclusion of the final line another ATV ranger ride takes you down the mountain to a van which will return you to the check-in location a few miles away. Minimum age for this tour is 10. Minimum weight is 75 pounds and maximum weight is 250 pounds. No one who is pregnant or who has neck or back injuries or cardiac conditions may participate. This tour is moderately strenuous; guests must be in good health and able to walk several hundred yards on uneven terrain and carry 10 pounds. All tours go out rain or shine; a minimum of 48 hours notice is required for cancellations or changes. All participants must sign a waiver of liability. 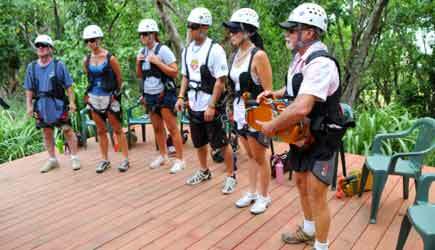 Because of the remote location of the ziplines it is not possible for observers to go along on this tour. Everyone must zip. 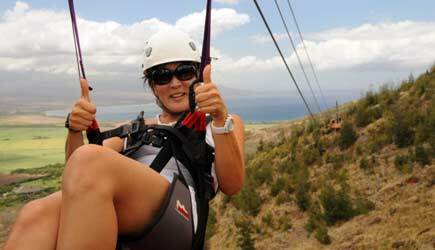 NCL cruise ship passengers are able do Flyin Hawaiian Zipline at 10am and 1pm on day one in port or 7am or 10am on day two in port. This is a 15 minute cab ride to and from the harbor, or we can arrange a rental car with shuttle pick-up at the harbor for approximately $40 per day. For rental cars with cruise ship shuttle pick-up see our rental car page. Lahaina cruise ship passengers should call to see if this tour can fit with their itinerary. A rental car would be required as the drive would be about 40 minutes. Please note that Lahaina is a tender port ... the time spent waiting for a shuttle boat to take you to shore is a factor. 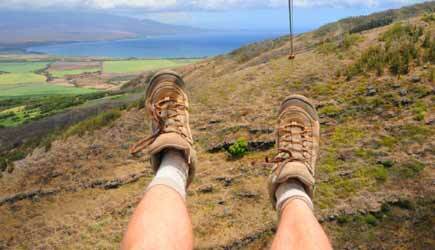 Thanks to Flyin' Hawaiian Zipline in a few years it will look like this! 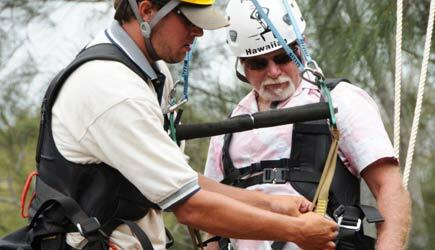 The builder and president of the Flyin Hawaiian Zipline is Maui native (and part Hawaiian) named Duane Ting. Duane learned that the privately owned land on the slopes above the Waikapu golf course was going to be sold, and the likely purchaser was a housing developer. 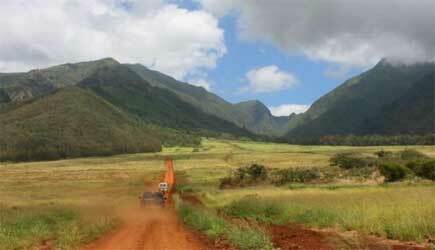 The large open space there called the "Waikapu Preserve" could be lost forever. Duane approached the landowner with a proposal ... "Instead of selling your land, keep it in the family. I will generate income for you so that your property taxes are paid, and at the same time I will preserve the land from development." 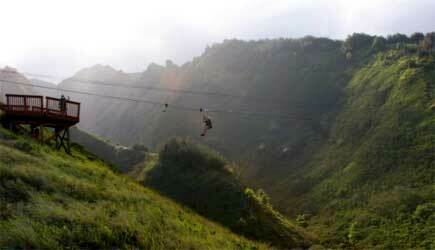 The landowner agreed and gave Flyin Hawaiian Zipline a long-term lease on the property. 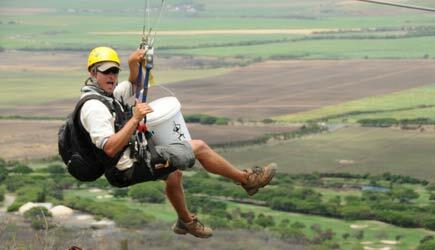 As the general contractor involved with the construction of two other zipline courses on Maui, Duane had the expertise to pull off this massive project, and he did it without the use of heavy equipment and bulldozers. He designed the zipline course so that most of the takeoff and landing platforms are hidden from view from the valley floor below. At the beginning of the course the ATV access trail to the top of the ridge was built so that it is completely concealed by the existing treeline. Unless you know exactly what you are looking for, most of this massive course is completely undetectable from below. The visual impact is almost zero, and the land has been saved from development. At the same time, Maui residents and visitors to our island have the exceptional treat of viewing this land that has never before been open to the public. Duane Ting's vision for preservation did not stop there. He learned that the rare native Hawaiian Hibiscus known as ma'o hau hele was on the federally endangered plants list and was only found in 7 places in Hawaii with a grand total of less than 60 plants in the wild. Ma'o hau hele is not to be confused with the common red and yellow chinese hibiscus varieties that are used as shrubbery all over Hawaii; those are not native to the islands and they certainly aren't rare. 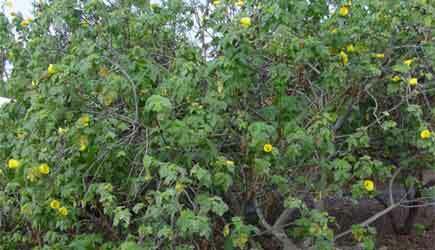 The native Hawaiian Hibiscus hibiscus brackenridgei is much more delicate, and it is the official state flower of Hawaii. 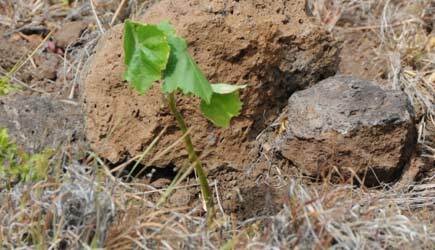 Duane learned that the slopes of the Waikapu Preserve were once the home of the Hawaiian Hibiscus before it was choked out by other more invasive plants that were introduced to the islands. With this knowledge, he obtained a permit from the US Fish and Wildlife Service to collect seeds from this rare plant and to propogate the species. 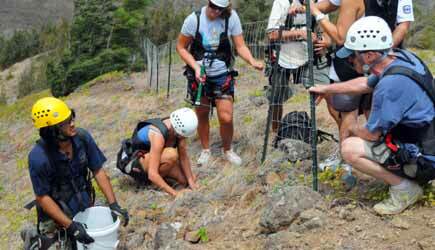 Now on each tour a seedling is taken along for the ride, and on a windy ridge abover Kaunohua Gulch zipline guests participate in planting and watering the native Hawaiian Hibiscus. Duane's ultimate goal is to see the plant removed forever from its endangered status and to be resetablished in the wild. We look forward to seeing a hillside full of these plants in the near future! Kudos! One other nice environmental touch at Flyin Hawaiian; instead of using plastic water bottles that could end up littering the preserve, all guests are given a complimentary aluminum water bottle which they can take home and reuse again and again! 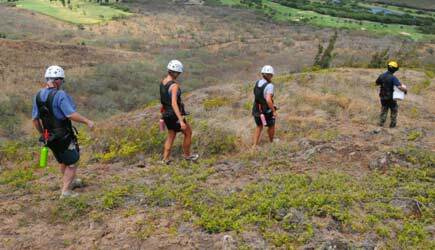 Zipline courses in Hawaii got their start on the island of Kauai about 10 years ago. The zipline tour was a single line that dropped down over a stream and was about 400 feet in length. Next a few multi-line courses appeared on Kauai and Maui. Each course tried to out-do the other; more lines, longer lines, more comfortable harnesses. The epitome of this progression is what you will find at the Flyin Hawaiian course. It is really hard to imagine that anyone will be able to top this; what Duane Ting has accomplished here is nearly miraculous. 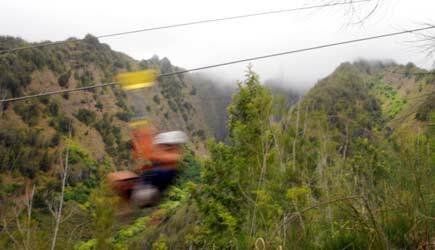 Flyin Hawaiian is the longest zipline course in Hawaii. They have the longest single line in Hawaii. They have the zipline with the highest elevation from the valley floor below (600 feet). How high is 600 feet? You could stack the Grand Wailea, the Four Seasons, the Westin Maui, and the Hyatt Regency on top of each other and still zip right over the top! On top of the extreme thrills, they are leading the way in eco-tourism and environmental preservation and restoration. Some zip line courses use a harness that tends to ... well ... get uncomfortable in certain places after you've been wearing it for a while (if you know what I mean). 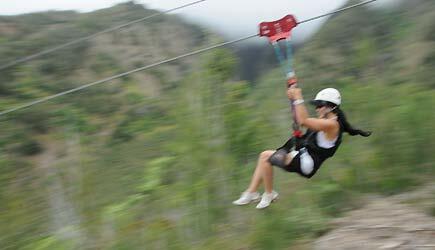 The harness that is used for these ziplines is adapted from the "seat" used by paragliders, and they are designed for comfort for the long haul. In other words, you won't be sore if you do this tour. That's a good thing! The pulley that is used on their zip lines is a heavy duty "trolley" that weighs a little over 10 pounds. You do need to carry the trolley from line to line. If you can't handle carrying the trolley, zip line tours might not be the best activity for you anyway. This event is best described as "moderately strenuous." Most people who are in average physical condition and overall good health can do this tour. There is far less than a mile of walking scattered throughout the tour. Most of the walks from the end of one line to the beginning of the next are rather short. The trails are rough; part of keeping this course from standing out on the slopes is not putting in steps, railings, and sidewalks. Guests do need to negotiate uneven terrain, and some of the walking is uphill. The longest walk is after you get off the ATV headed uphill toward the second line. It only takes about 5 minutes, but it is definitely UPHILL. I think the best comparison is this ... if you can't carry a 10 pound bag of groceries up three flights of stairs without having to stop and catch your breath every few steps, then this tour is not for you. The tour is long and encompasses all of the lines. There is no "short tour" or partial course offered. From our experience the 5 hours just seemed to fly ... LITERALLY!!! Tours are limited to 8-10 guests per timeslot. Three guides accompany the group. One guide oversees setting you up on each line and facilitates your safe take-off. The second guide is at the receiving end to assist you on the landing. The third guide operates the heavy-duty breaking system that is built into the end of each line. A fourth staffer is used to trasport you to the base area in the heart of the Waikapu Valley and then at the end of the tour picks you up. Considering this tour requires four staff to operate a tour for 8 to 10 guests, the price is incredibly affordable! A word about cameras and video cameras. Small ones are fine, but they are best left in the pack that is built into your harness while you are actually zipping. This tour operator does give you the freedom to change up the order during the tour so that you can take turns shooting photos of other members of your group taking off at some lines and coming in for a landing at others. Once you get confident, you can take some pictures or shoot video while you are zipping on the moderate length lines in the middle of the course. Very large cameras aren't a good idea and should be left at home. 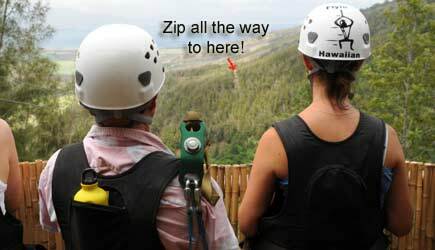 Flyin Hawaiian Zipline will force all the others to re-write their brochures in the name of truthful advertising. We expect a few of the other guys will take a LONG time to do that. Don't be fooled by a course that says they HAVE the longest zipline; what they really need to say is "We USED TO HAVE the longest zipline until Flyin Hawaiian came along."